Join us for a hike on Sunday afternoon, September 30th! Enjoy God’s creation and the gift of fellowship as we hike in our beautiful mountains. Everyone is invited to join us on the path. The hike will last no more than 90 minutes and will have gentle terrain and little elevation gain. A water bottle, snack, hiking stick and weather-appropriate clothing are all that you might need. We will meet in the church parking lot at 3:00 PM and will return no later than 6:00 PM. 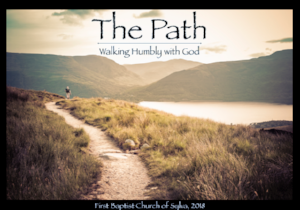 In keeping with our theme of Path: Walking Humbly With Our God, we will be taking a monthly hike together throughout the year. If you have questions, contact Jeff.